Fifa presidential candidate Tokyo Sexwale says he is "open to negotiations and alliances" with his rivals before Friday's vote. The South African faces Asian Football Confederation president Sheikh Salman, former Fifa deputy general secretary Jerome Champagne, Jordanian Prince Ali and Uefa general secretary Gianni Infantino in the race to succeed Sepp Blatter. Blatter, 79, banned for eight years for ethics violations, was already stepping down this month. The Swiss had been in charge of world football's governing body since 1998, having won June's election ahead of Prince Ali before resigning days later. Blatter is now barred from all football-related activities, along with suspended Uefa president Michel Platini, who has withdrawn from the Fifa race. The pair deny any wrongdoing and are appealing against their bans. They should find out the result ahead of this week's extraordinary congress meeting in Zurich. Sexwale, 62, said on Monday he was a "realist" over his chances and hinted at striking a deal, adding: "It's like the Vatican, you never know what will come out." 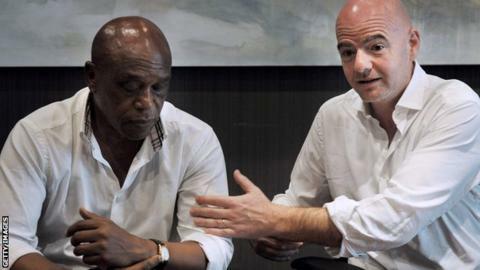 Meanwhile, Infantino said he hoped to get most of Africa's 54 national votes, despite the Confederation of African Football (CAF) endorsing Sheikh Salman - his fellow frontrunner. Both men were talking at a news conference held together after visiting Robben Island, where Sexwale spent 13 year imprisoned. The vote of up to 209 Fifa member federations takes place with the organisation embroiled a corruption scandal with dozens of senior officials indicted by United States' prosecutors. Meanwhile, a survey of 25,000 football fans by anti-corruption campaigning organisation Transparency International and fan opinion platform Forza Football found 69% had no confidence in Fifa. And when asked which of the five presidential candidates was the best man to run Fifa, 60% answered "none of the above". The survey, which included supporters from 28 different countries, also found that 43% said their enjoyment of football had been affected by the Fifa corruption scandals.